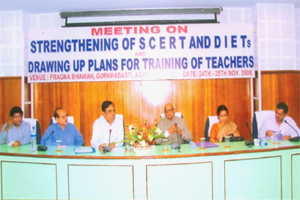 STATE COUNCIL OF EDUCATIONAL RESEARCH & TRAINING (SCERT) Teachers Training To bring out qualitative improvement in School Education, the State Council of Educational Research & Training (SCERT) was established by the Government of Tripura in 1996. Since then, the SCERT has been organizing Inservice and Pre-service training for Teachers and Supervisory personnel, research and publication of instructional materials and also at the same time doing the needful for the improvement and revision of curriculum of test books. 1 (one) IASE and 4 (four) DIETs in 4 Districts of Tripura have also been established by the Government of Tripura in order to cover up all the untrained teachers in the School system. At present there are 4 functional DIETs and 1 IASE in the state which provide institutional training to the existing teachers. There is a huge backlog of untrained teachers because of limited facilities. Necessary step will be taken to provide institutional training to 12000 untrained teachers during 11th plan. Besides one new DIET will be set up at Khumulung, Headquarter of TTAADC and infrastructure of the existing 4 DIETs would be strengthened. Attempt will also be made for strengthening of SCERT in phased manner.